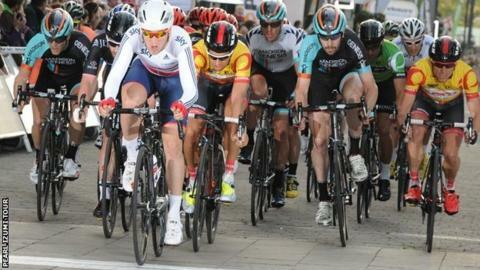 The Isle of Man is to host an annual three-day cycling festival from next year, based in the north of the island. The island has a rich cycling history having staged Britain's biggest festival, International Cycle Week, for almost 70 years until 2003. Cyclefest, scheduled for May 2016, will see professional cycling return to the island for the first time in 13 years. Organisers said the festival will celebrate the island's "unique culture, environment and terrain". The three-day festival will include the opening stage of the Pearl Izumi Tour, which features the UK's leading professional teams. A Tour spokesman said: "The Isle of Man is a hotbed of cycling talent. "Having an Isle of Man stage on our Tour can only add value to the event and hopefully inspire future generations of Manx talent." "We were proud when they approached us to headline their festival." The festival will also include a 'mass participation' ride, mountain bike challenge and Sportive on the Isle of Man TT course. This year, including household names such as Mark Cavendish and Peter Kennaugh, eight Manx cyclists were selected for the Great Britain Olympic Development squad. Director of Cyclefest, Paul Phillips, said: "We are trying to create a standout experience that can capitalise on the growing popularity of cycling and make a significant contribution to the local economy." Organisers are also working with the Isle of Man Cycling Association, who are currently bidding to bring the British Cycling National Road Championships to the island the same year. It could be an "epic year for cycling on the Isle of Man", said Phillips.